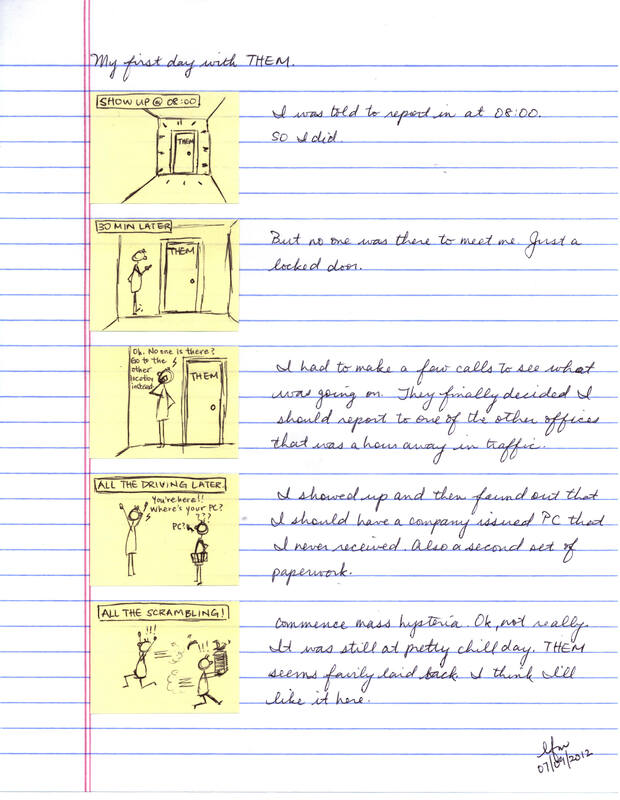 penmanship | Random moosages as I see fit. Still making progress through my backlog of Whimseyboxes. I may have said last time that I wasn’t working through them in order. If I didn’t, well I’ll just say now that I’m not going through them in chronological order. So this week’s craft was courtesy of February’s Whimseybox…as in last month’s. February’s box was for washi tape mini memo boards. Washi, for those not in the know, is a style of Japanese paper making. Combine long, thin rolls of that paper with some acrylic glue, and you get tape. Washi tape is typically fairly decorative and is low tack, so you commonly see it in stationery. 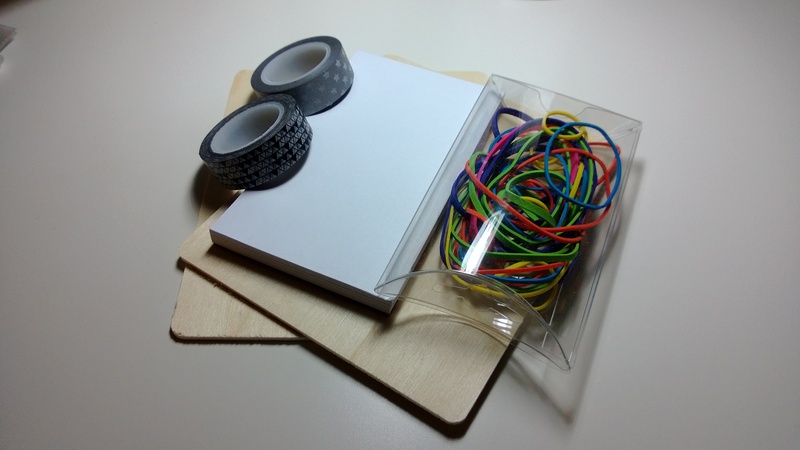 In the box were three wooden boards, a pad of paper, two rolls of washi tape, and a small box of colorful rubber bands. I think I might have gotten some small Whimseybox buttons in this shipment. I can’t remember and I’m stuck in a hotel right now, so I can’t check. We’ll just say there were some buttons and that was the advertisement for February. Only two boards are shown because I accidentally started working on one before I took the materials picture. Oops. Directions for the project was to decorate the boards with washi tape however you wanted and then to either use the rubber bands to support the pad of paper or to kind of haphazardly loop the rubber bands around the board so that you’d have a memo board. And here are my boards. I decided to paint some of the boards because I thought it might make a nice contrast with the tape. Otherwise, I followed the instructions. There’s not much else to do besides follow the instructions, really. 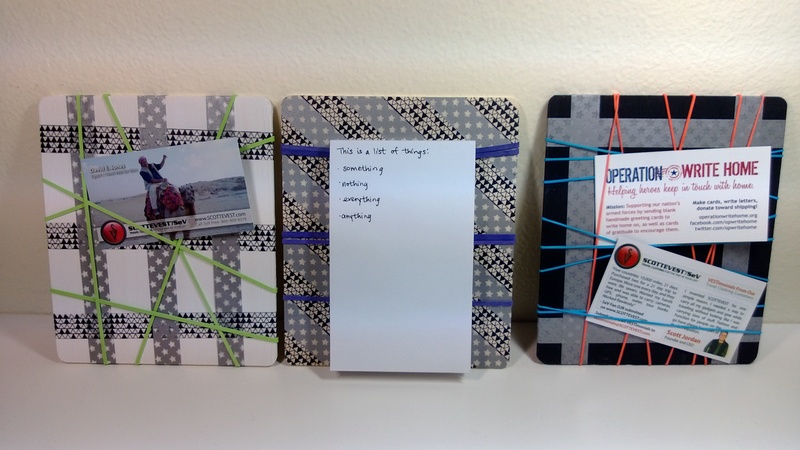 The memo board on the left was painted white (acrylic) and then the tape was in applied in a woven pattern. Um…you can’t really see that it’s woven. I opted for only green rubber bands to complete the board. The center board ended up being a notepad holder. I didn’t paint this one and covered the entire board with tape in alternating stripes. I looped the rubber bands around in rows to support the back of the pad. You might notice that the upper right corner is missing some tape. There was tape there, but it fell off before I took the picture. I didn’t notice until after. Alas. Also, you get a sample of my handwriting. Um…I haven’t practiced. The memo board on the right was painted black (acrylic) and then I used the star tape only as a frame. I finished it off with lots of orange and blue rubber bands. It may have been too many rubber bands. If you use a huge mess of rubber bands on such a small board, it gets kind of hard to stick anything onto the board. Just FYI. So, there they are. The business cards you see are for Scottevest and Operation Write Home. Why did I pick these business cards for the photo? Well, because I actually made the memo boards to help me hold business cards that I use a lot. But I didn’t want to use client and colleague business cards for the photo and both Scottevest and Operation Write Home gave me a TON of their business cards. I have a couple jackets from Scottevest. I like the concept (POCKETS! POCKETS EVERYWHERE! ), but I have found that the quality of their products can vary. Their customer service is nice and responsive. They will take care of you if you’re really unsatisfied with what you receive. Operation Write Home is really great if you like to make cards or write letters but don’t have a lot of people to send stuff to. Operation Write Home sends snail mail to the troops overseas to help cheer them and ease the homesickness. You should check it out. And…here ends this week plug for a whole bunch of things, I guess. Here’s a brief, illustrated recap of what happened to me on Monday. Also, you have a sample of my handwriting, which I haven’t specifically been practicing, but it has been looking fairly decent of late. Since I ended up reporting to an office that was not to be my home office, nothing was prepared for me. Of course, I doubt anything would have really been prepared for me if there had been someone at the home office anyway. Because I found out on Tuesday that my laptop had somehow been rerouted to a client site instead of coming to me. It wasn’t exactly THEM’s fault. THEM apparently had UPS reroute another laptop to a contractor who was at a client site. Somehow, UPS decided that meant my laptop should go to him too. So he had two. I think. It would have really sucked if he had mine and didn’t have his. Anyway, right now the theory is all of my missing new hire paperwork was also routed to him because I never got any of it. It made going through orientation rather interesting since I had nothing to refer to and just had to listen to THEM talk about all this stuff. ALSO! On Tuesday I received ALL THE PACKAGES! Ok, so not all of them. But they issued me a company credit card for when I’m on the road (supposedly it cuts down on paperwork! ), gave me the badge to the building (helpful! ), the key to the office (helpful! ), had someone drive out to the client site to retrieve my wayward laptop (so very helpful! ), had a box of clothes delivered to me (they expect ALL MY ALLEGIANCE I think because it contained so many shirts and even a jacket with the company logo), and I got to meet the CEO. He happened to be in CA and when he’s around, he likes to visit all the offices. He seems like a really nice guy. I was treated to a general meeting in which the term “old fart” was used waaaaay more than I’ve ever heard in any meeting setting. I was thoroughly entertained. I think, I might just work for the most entertaining company ever. EVAR.